This profile is part of a three-part series, intended to be read in order. 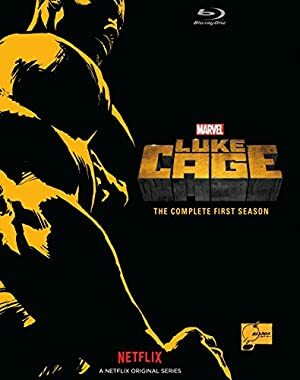 Luke Cage (Netflix version) – Hero of Harlem (this here profile). 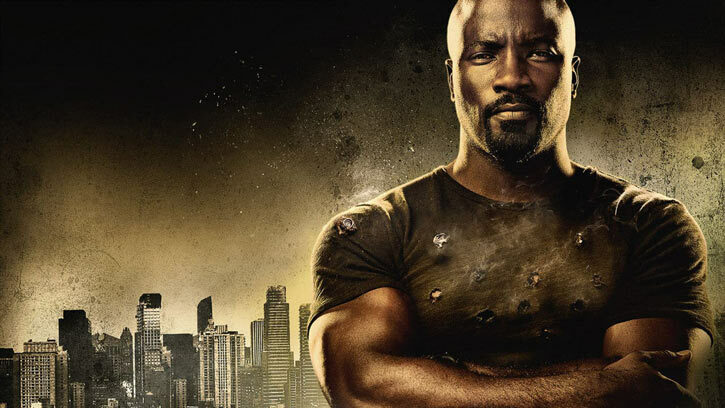 Luke Cage (Netflix version) – Quotes and game stats. Pop’s death was the tipping point for Cage. He went to the Crispus Attucks Complex where Dillard kept her campaign money, and stormed it. Cage casually walked through the complex while her thugs’ bullets bounced off of him. He dispatched them as he made his way to her safe. He cleaned it out and exited the building. He then returned to the bullet ridden Pop’s. Luke gave the money to Bobby Fisher, a life long friend of Pop’s. Thus, the barber shop could remain open and Pop’s legacy could continue. Cottonmouth had grown weary of Cage’s meddling. He ambushed him while he was having dinner. He fired a rocket launcher at the shop, burying both Cage and the restaurateur in the rubble. But Luke was unhurt and was largely able to shield Lin from the attack. He punched his way out of the rubble. He was greeted by firefighters, the police, and a host of reporters – as well as Misty Knight. Cage declined comment or any praise. Instead, he quietly disappeared into the night. Him surviving the blast and digging his way out had not gone unnoticed by the downtrodden residents of Harlem. He started to get fan mail at Pop’s barber shop. People began to approach him and request his aid. Both Cage and Cottonmouth attended Pop’s funeral. Both speeches were littered with thinly veiled threats against the other. Both were a call for Harlem to join them. By this time Cage had become a divisive figure. Many didn’t trust him, but many in Harlem saw him as a protector. Cage then approached Mariah Dillard during a press conference. He told her that once he took care of Cottonmouth that she would be next. Later he ran into Claire Temple in a coffee shop. He remembered her as the nurse who had previously helped him. After departing Claire followed him back to his apartment. The pair returned to Pop’s, where Luke had recently taken up living. Inside, they found a trail of blood leading to a badly wounded Rafael Scarfe, Misty Knight’s corrupt partner. Scarfe refused to go to the hospital or have the cops involved. He explained that he had been funneling Cottonmouth his guns in exchange for large sums of money. The pair had a falling out which resulted in a gun battle that Scarfe lost badly. Cage grew angry at Scarfe for his involvement with Cottonmouth and for murdering Chico. However, he was dissuaded from killing him by Claire. Scarfe offered Cage a list of cops who were on Cottonmouth’s payroll in exchange for protection. Cage then went to Scarfe’s apartment to retrieve the list. Cage managed to retrieve the list, but was confronted by Misty – who had been surveilling the place. Rather than fight her, Luke escaped by jumping out the window. Claire then borrowed a van and enlisted the help of an EMT whom she trusted. The plan was to take Scarfe to the police station with the list and turn them over as evidence. But the traffic was unusually congested as Cottonmouth had sent his thugs out in full force to search for Scarfe. The group was ambushed and wound up abandoning the van to take shelter in a building. Cage engaged the thugs to give the rest of the group a chance to escape. After securing their escape he then saved them again as another van tried to run them over. Misty happened upon the scene and Scarfe died in her arms while he apologized for his misdeeds. Thinking that this would be enough evidence to lock Cottonmouth up for good, Cage and Temple left. While Cage and Temple were walking Cage was shot by a sniper… whose bullet actually penetrated his skin. They tried to flee the scene in a van, but the sniper shot it until it exploded. The shooter then revealed himself to be none other than Willis Stryker, Cage’s estranged childhood best friend. Stryker was Diamondback, the puppet master behind Cottonmouth and Cage’s other foes. Stryker retreated when it was clear the police were on their way. Claire then took Cage to an unused clinic to care for his wounds. Misty Knight was able to track them down there. Diamondback had followed them and began shooting up the clinic with more of his special Judas bullets. The two fought briefly, but Diamondback was again forced to flee when his gun jammed. Misty Knight chased him outside, but Stryker snuck up on her. He had the detective dead to rights, but rather than shoot her he merely taunted her. For Diamondback, it was more fun to prolong Cage’s agony with the knowledge that all his friends’ days were numbered. Cage pursued Diamondback to a theatre. There Diamondback took up position to snipe (and taunt) Cage. However, Luke was able to dodge the bullet at the last second, then smash the pillar holding the balcony up where Diamondback had made his sniper’s nest. This turned the fight into a melee. Diamondback was able to injure Cage, using a metal bar to hammer Luke’s gunshot wounds. But Cage’s superior strength eventually won out and he was able to toss Diamondback out of the theatre. Once outside, Cage was again faced with Diamondback’s muzzle. Cage implored him to stop since he considered him to be like a brother. Diamondback snapped back that they were indeed biological brothers. He then shot the confused Cage in the shoulder, causing him to fall into a garbage truck. Cage awoke later that day. Two patrol officers confronted him, and Cage thus learned that had been framed by Mariah and Shades for the murder of Cottonmouth. Even wounded, Cage was easily able to subdue both cops. Cage was able to locate Claire, so she could help with his wounds. The pair tracked down Bernstein, the mysterious doctor who had given Luke his powers. He had become obsessed with Cage and was more than happy to help. But the process allowing for treating Cage’s gunshot wounds was dangerous, and caused Cage to go into cardiac arrest. Claire’s quick and creative thinking saved Luke, and they were able to remove the bullet fragments from his body. However, Temple and Cage discovered that Bernstein had copied personal files. When confronted, the doctor proudly admitted that he would be restarting the program and enhance more subjects. The furious Cage smashed up Bernstein’s lab. He angrily stated that no one should have to suffer through such a process. The NYPD still was after Cage. This led to abuses, including one where a White cop tried to beat information about Cage out of a Black teen. The incident got media attention and Mariah Dillard threw her support behind the teen. She organized a PR event at Harlem’s Paradise to show community solidarity. Luke and Claire went to the event to try to clear his name. Misty was also present, and she happened upon Diamondback while snooping around in the backrooms. She attempted to arrest him, but Diamondback was quicker on the draw. He managed to shoot her in the arm, but Cage intervened and saved her. The sound of gunshots turned the event into a gun battle. Diamondback’s mercenaries tried to stop Cage using regular bullets which obviously couldn’t hurt him. Cage fled into the kitchen, focusing on keeping the wounded Knight safe. He knew of hidden, Prohibition-era tunnels within. While Luke was hiding Misty, Diamondback and his mercenaries took Claire and others hostage. Among them was one Candace, who knew Cage from when they worked in Harlem’s Paradise together. She also was the key witness in tying him to Cottonmouth’s murder. Candace’s testimony had of course been completely false. She had been coerced into it through bribes and and intimidation by Mariah Dillard. Dillard’s goal was both to frame Cage and to cover up that she was the one who had murdered her cousin. Diamondback used the PA system to warn Cage that he would start killing hostages if Luke didn’t face him. Just as the SWAT team was about to storm the building, Diamondback threw a hostage over the ledge. Cage saved her from this fall, but that meant that he couldn’t flee from the police. The SWAT officers having Judas bullets, Cage was forced to surrender. Misty confronted Cage as he was being arrested. Though for outsiders it sounded like a fight, they were actually using innuendo to confirm that they were still covertly allies. Cage then escaped while en route. Luke tracked down one of Diamondback’s men. He intimidated him into giving up the crime lord’s location. But he was too late. Diamondback had had a falling out with associates, and slaughtered them using a new unknown weapon. Before dying the lone survivor told Cage that even he couldn’t hope to beat Diamondback now. Dillard and Shades now realized that they were in over their head. Thus, they agreed to hasty meeting at Pop’s barber shop. Diamondback’s reckless bloodlust was jeopardizing everyone, and creating too much police heat. However, Stryker crashed the party. He was now wearing a suit of power armor that put him on equal footing with Cage. The others evacuated and Cage stayed to face his half-brother in the final showdown. He tried repeatedly to talk down the crazed criminal, but to no avail. After destroying much of the barber shop the fight took them outside. There, the crowd cheered on Cage as they fought. During the fight Cage noticed that the suit was running out of power. He used boxing techniques to wear down his opponent, and Diamondback exhausted his suit’s power. Luke then took him down with a single blow. Cage was then voluntarily taken into custody. After a lengthy discussion at the precinct his name was cleared. He and Claire were going to hook up, but Federal marshals arrived. They took him into custody as the escaped convict Carl Lucas. The series ends with them transporting him to prison. 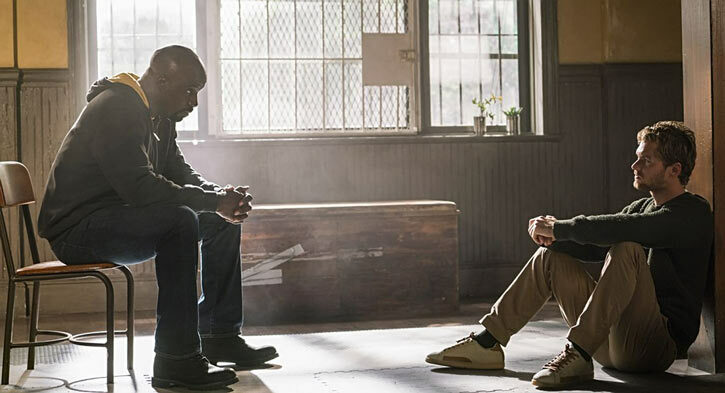 At the beginning of Defenders it’s noted that some time has passed. Implicitly, Cage spent most of his time incarcerated in quiet contemplation. As he leaves prison, Luke is met by Foggy Nelson, who explains that Hogarth’s firm has successfully represent him. The legal aspects aren’t discussed on-screen. Returning to New York City, Luke has a steamy romantic reunion with Claire. While he used to be a reluctant hero, Cage now is intent with helping others. He also wants to go after Mariah Dillard and Shades. However, Claire is concerned about how this new outlook will make his — and theirs — life difficult. Misty Knight, now on a citywide task force, comes to enlist Cage’s help. Somebody has been recruiting lads in Harlem, and several of them have gone missing. One of them, Cole, is the son of a Harlem woman who already lost two children — Candace and her brother — to crime. This convinces Luke to help. He finds Cole and offers his guidance, but the young man rejects Cage. Investigating, Luke finds Cole in a warehouse full of bodies. He and the others have been hired by ninja cult the Hand to dispose of the bodies of their enemies. As he keeps digging he runs into Daniel Rand, and he brief fight ensues. They disengage as the police arrives, unsure as to each other’s identity. However, Claire identifies Danny from Luke’s description and sets up a meeting. While Luke is unimpressed by Daniel rambling about martial arts magic, he inspires him to change tactic and use his corporate influence against the Hand. Cage then goes looking for a person nicknamed “White Hat”. This leads to again meeting with Danny, who is about to be overwhelmed by Hand ninja. Cage turns the tide. His arrival is followed by Jessica Jones’ and Daredevil (Matthew Murdock)’s. However, the ninja are then reinforced by “Black Sky” – actually a resurrected Elektra Natchios. Elektra’s presence turns the tables again, until Rand can force her to disengage using the iron fist. The four heroes then regroup at a Chinese restaurant. However, they do not trust each other. Their differences in motivations, goals and personalities are too strong. Daredevil’s mentor Stick arrives to mediate. While the argument resumes, the Hand assaults the restaurant in force. ”White Hat” — actually a ninja named Sowande — manages to hurt Cage using mystical martial arts, but Luke knocks him out and captures him. As the four heroes interrogate him, Sowande’s taunts reveal that Danny is the key to open some sort of gate. Sowande attempts to escape, but Stick decapitates him. The rest of the group then decides to hide Danny away and keep him safe. But Danny’s idea was more along the lines of charge into battle recklessly. After a short argument they wind up coming to blows. 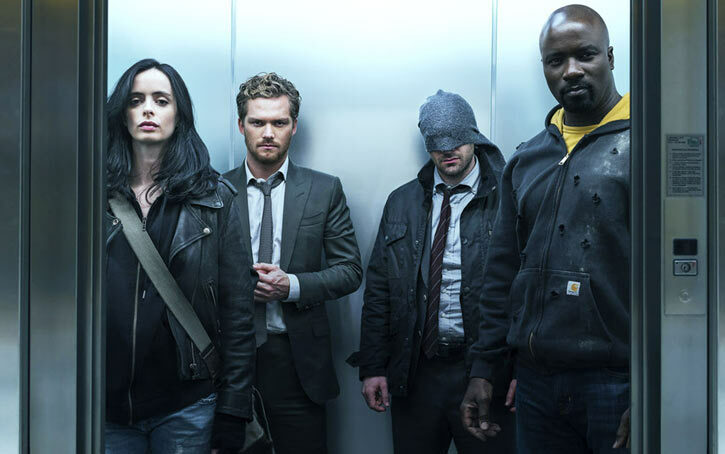 Iron Fist is quickly overwhelmed by his teammates. Stick and Luke are left to guard Danny, but Stick uses incense to knock Cage out. His plan is to murder Danny so the Hand can’t use him, but Matt and Jessica return just in time. During the ensuing battle Elektra shows up. In the confusion she kills Stick and kidnaps Danny. Jones, Murdock, and Cage all wake up at the police station under suspicion of murdering Sowande and Stick. 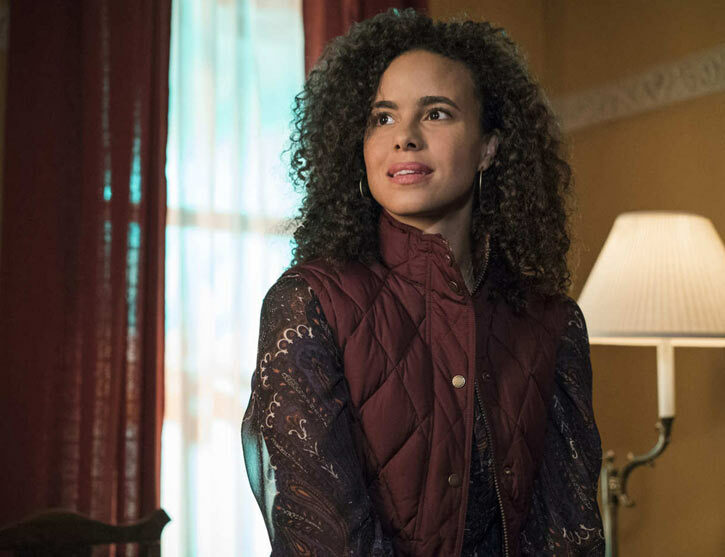 Misty comes to their defense, but they don’t tell her much and simply demands a meeting with their lawyer. Cage then simply busts down the wall and they beeline back to Midland Circle to confront the remaining Fingers of the Hand – Gao, Bakuto, and Murakami. An intense fight forces these three to fall back, and Defenders ally Colleen Wing arrives with explosives. The police surrounds the building, but Misty reluctantly agrees to aid the Defenders. Entering the basement reveals that the Hand tricked Danny into opening the gate. This allows them their prize – dragon bones. With these bones they will once again be able to resurrect themselves. However removing the bones will weaken the city’s structure, leading to landslides. The rest of the group frees Danny and engages the Hand in the final battle. Colleen defeats her former sensei Bakuto, but killing him sets off the explosives prematurely. Matt senses this, and warns the others that the building is about to crumble. The group escapes, but Matt stays behind to try to save Elektra. The NYPD chooses to cover up the incident, which means that the Defenders are off the hook for any charges. Foggy reminds Luke that his company’s legal services are at his disposal. Luke is later seen talking to Jessica in a bar, to remind her that he is there for her should she ever need him. 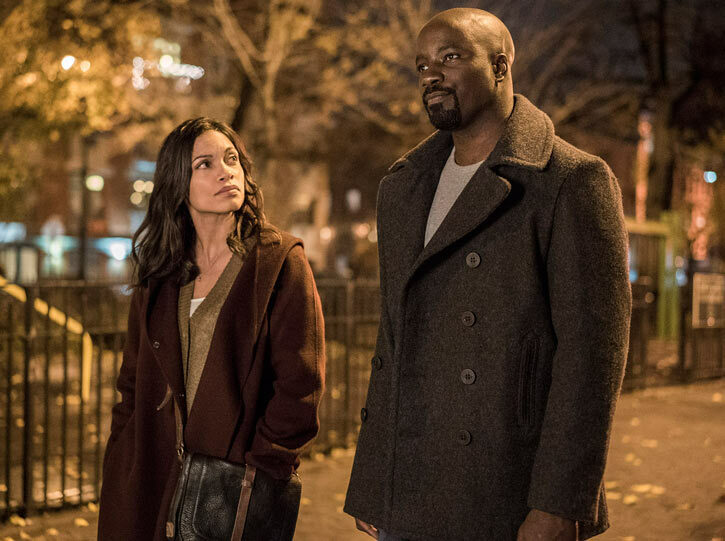 Luke Cage Season 2 has already been confirmed. 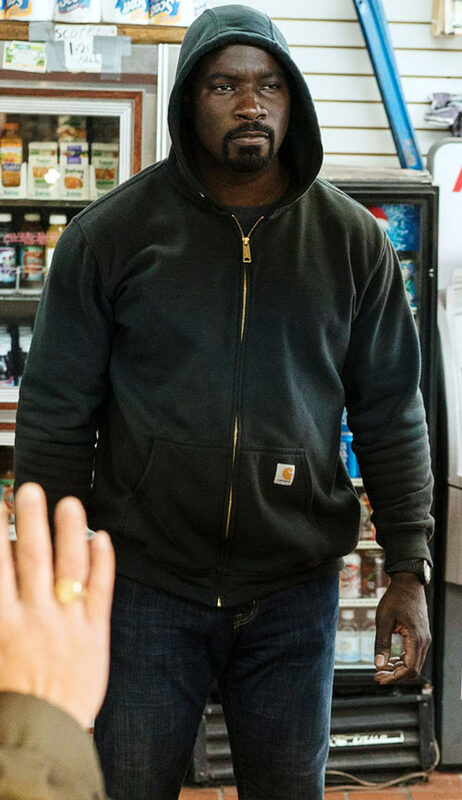 Luke Cage is a huge, bald, Black, unusually handsome man. He is in superb physical shape and sports a stylish goatee. However, he is low-key and down to earth in his body language. That lasts until he gets determined and going, at which point he is a force of nature. When in the spotlight he generally comes off as well-spoken and fairly charismatic. But he usually keeps a low profile when in a crowd. He often wears a hoodie and other nondescript urban clothing. That allows him to blend in, hides his feature, and gives him an everyman appearance. However, they almost always wind up full of bullet holes. In formal occasions, he’ll wear finely tailored suits. During his time in Seagate he had much longer hair and a scruffy beard. That gave him a much more disheveled look. Cage thinks that super-hero costumes are ridiculous, and would never wear one. 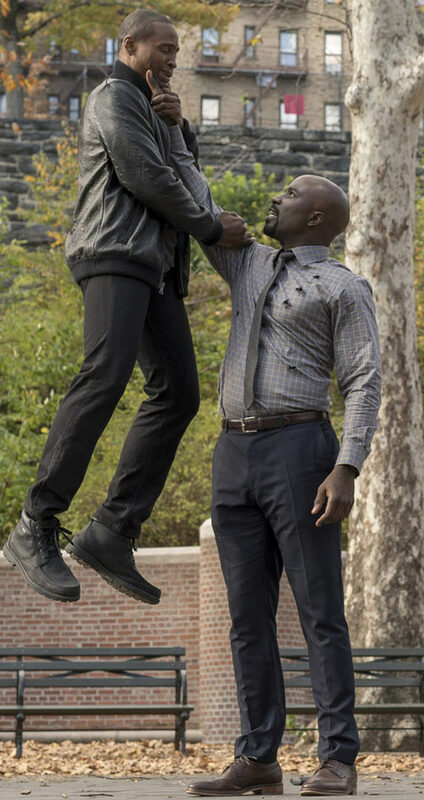 Luke Cage is a noble and gentle soul. He only fights to protect himself or others. He has also shown remarkable control when it comes to violence. Despite his tragic past, when confronted with those who have greatly wronged him, he is still measured. He only uses enough force to knock them out when he could easily kill them. Though his temper has gotten the better of him a few times — particularly against Stryker — he is not a killer at heart. Cage typically resolves combat by slapping an opponent unconscious or rag dolling them, so his immense strength doesn’t result in involuntary kills. That said when determined and set on a goal, he becomes a force of righteous fury to be reckoned with. Cage is a humble, down to earth man. He doesn’t lust after fame, money, or power. He is perfectly fine with being Joe Average the bartender, paid an honest day’s wage for an honest day’s work and living the working class life. 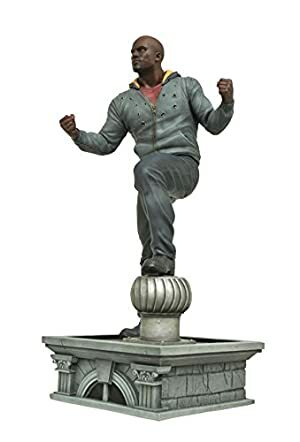 He’ll normally turn down rewards, such as prizes from the pit fights in Seagate and money from Connie Lin for saving her restaurant. Cage almost feels humiliated for having superpowers. They are something that he was given without earning. They’ve harpooned any chance he had at ever living a normal life. While uncomfortable with being enhanced, he has started coming to terms with it, and to accept that this power can be used for the common good. In DC Heroes RPG terms, he was initially a poster boy for the Unwanted Power Motivation. But after Pop’s death, he started his shift towards the Responsibility of Power Motivation. After his second stint in Seagate he comes out a changed man. He’s finally made peace with his powers and his role in his community. Furthermore, he now realises that he is one of the very few people in his community who can truly make a difference. He can make the streets safer, and inspire others. Out of all the Defenders he seems by far the most comfortable with his role as a hero. Matt’s mix of violent fury, wish to protect the innocent and Catholic upbringing make him a tortured soul. Danny is too privileged and out of touch due to his wealth and monastic training, and too impulsive and careless. And Jessica would never, ever accept to be called heroic. By contrast, Luke is interested even in small-scale ethical actions, such as reaching out to and counselling troubled youths. Think of him as the most badass community volunteer ever. Cage is the son of a preacher man . As such he doesn’t like swearing, and he’s kind and courteous toward everyone. Well, as long as then-word isn’t involved. He’s also respectful toward women. Luke caught Misty’s attention by steadily looking her in the eyes rather than getting distracted by the globularity of the cocktail dress she was then wearing. This section would not be complete without mentioning the love of his life, Reva. Cage found true happiness with her. He was devastated when she died, and went on a quest so he could understand why she had been killed. Despite his numerous dalliances, Reva will remain the love of Luke’s life. This profile ends in part #3, with the quotes, stats and technical considerations. By Dr. Peter S. Piispanen and Tom Eiler.